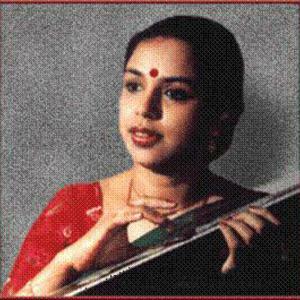 Sudha Ragunathan is a singer in the Carnatic musical tradition of southern India. Sudha was initially trained by her mother Smt. Choodamani since the age of nine. She continued training under Sri. B.V. Lakshmanan. Even as a student, Smt.Sudha Ragunathan received the Central Government Scholarship for Young Artistes for advanced training in Carnatic Music. Sudha came under the tutelage of the illustrious Padmabhushan Sangeetha Kalanidhi, Dr. M.L Vasantha Kumari in 1977, who encouraged Sudha to pursue music as a career. Sudha is one of Dr. M. L. Vasanthakumari's prominent successors. Sudha was initially trained by her mother Smt. Choodamani since the age of nine. She continued training under Sri. B.V. Lakshmanan. Even as a student, Smt.Sudha Ragunathan received the Central Government Scholarship for Young Artistes for advanced training in Carnatic Music. Sudha came under the tutelage of the illustrious Padmabhushan Sangeetha Kalanidhi, Dr. M.L Vasantha Kumari in 1977, who encouraged Sudha to pursue music as a career. Sudha is one of Dr. M. L. Vasanthakumari's prominent successors. Sangeetha Choodamani in 1997 from Sri Krishna Gana Sabha, Chennai. Sangeetha Kala Sarathy from Sri Parthasarathy Swami Sabha, Chennai from His Holiness Shri Jayendra Saraswathi of Kanchi Mutt. Sangeeta Saraswathi from The Mahasannidanam of Sringeri. Gana Kuyil from Valmiki Manram, Chennai. Isai Peroli and VST Award for excellence from Karthik Fine Arts, Chennai. Sudha has a golden touch in her voice which enthralls her listeners from all over the globe. There is tantalizing mystery behind that cherubic smile. Her deep relish for tradition and mystical old-world charm is supremely addictive. Her foundation in the world of music was laid at a very young age and it was her mother Smt. Choodamani who groomed her, before the onus to nurture her music fell upon Vidwan Sri. B.V. Lakshman. Sudha initially wanted to become a doctor, but the thought of performing dissections so repelled her that she gave up the idea. ?It wasn't that I was a bad student. My dissections were always neat and my diagrams were perfect, but I always found myself fainting at the sight of blood!? She proved her prowess both in academics and in music and now, stood at a juncture where two roads diverged - there was ?something' that was needed to push her onto the road less traveled by. Enter Padmavibushan Sangeetha Kalanidhi Dr. M.L. Vasanthakumari, hailed by many as a musical genius, a doyen of Carnatic music. In 1977, Sudha won a Central Government scholarship that gave her the opportunity to come under the wings of this master of a great parampara. From this point on; there was no turning back. Sudha had the golden opportunity to provide vocal support to MLV for about a decade. Of MLV, (as she was affectionately called by all) Sudha often said ?Music was only one of the few things she taught me. She taught me how to live life to its fullest.? Sudha, with a touch of nostalgia, vividly recalls how while singing an Ashtapathi in ragamalika, there would come a sangathi in Yaman Kalyani at a higher octave. Spontaneously, MLV would stop and allow Sudha to take over. ?She was such a generous person on stage?.in some sense it also reflected how she was in life as well.? From 1990, Sudha's rise was phenomenal, and following her Guru's demise, she has been considered as MLV's vaarisu. Sudha is a top ranking artiste for Prasar Bharati, Chennai and performs at important events of All India Radio and Doordarshan. Music had now taken centre stage but for Sudha it would not be at the cost of her academics. She holds an M.A. in Economics. Being such a vivacious, versatile and highly talented individual, it's no surprise that Sudha won the award- Outstanding Student of Ethiraj College, for three years in succession- an achievement which for a long time remained unmatched. She was the Treasurer and later the Vice President of the Students Union and won the prestigious ?Service to the College' medal. Sudha's rise to prominence has not been an easy task.? Being a recognized musician requires tremendous amount of hard work. One good performance alone is not enough and there is a lot of practice one has to go through. It usually takes an artist around seven to ten years to become well known and the financial returns might be mediocre?.one has to be determined enough to stick through it all.? Sudha carved a niche for herself in the Carnatic School of singing, thanks to her voice that packed 'swara' and 'shakti'. Her distinctly stunning vocal style and effortless singing made her the most sought after artiste for several prestigious concerts. As the brightest singing star on the horizon, her voice mesmerized 'rasikas' across the country and beyond the Indian shores. Sudha is a top ranking artiste of the All India Radio and the Doordharshan, besides being the artiste in demand by leading recording companies like AVM, INRECO, VANI and AMUTHAM. With her crystal clear and almost divine voice, Sudha reached out to the discerning music lovers across the world, widening musical communications across the cultural borders. Today, Sudha Ragunathan is known for her beautiful vocal tapestries, soaring solos and unusual timbres. Her creative expression in Carnatic music has no par. And, her music is known to flow straight from the heart, dripping with classical divinity. Her authentic renditions of 'krithis' and refined elaborations of 'ragas', the ?lan with which she breezes through the 'kalpana swaras', her command over the octaves and her supremely confident stage presence combined with unstated humility has given her an enviable pre-eminence in the world of Carnatic music. Call it her 'Guru Dakshina' to her mentor, Dr.M.L.Vasantha Kumari. In the world of voices, can you hear my song? ?The enthralling, enchanting voice of Sudha and her entrancing harmonies have graced several 'kutcheries' and celebrations. She was the auspicious voice at the first live broadcast of the National Program Series of concerts hosted at Chennai. Sudha also has the unique honor of rendering 'Vande Mataram' at the Central Hall of Parliament, New Delhi on 27th January 2000 to mark the completion of 50 years of the free Indian Republic. Even today, Sudha has to work tremendously hard to keep up the reputation that she has built. And now, with a husband, and two children, there never seems to be enough time. ?It's Stress with a capital ?S', she sighs?. ?I wouldn't have come this far if it wasn't for my family; they've co-operated tremendously.? Music has given Sudha plenty in life and she plans to give back to it some in her own special way. Apart from teaching or starting a music school, Sudha plans to release a series of cassettes and CDs in collaboration with other senior artistes that bring out the therapeutic effect of Carnatic music. She is also the Managing Trustee of ?Samudhaaya Foundation?, started in 1999, with a ?cause? in mind. To play her role in giving back to society what she has gained ? immense love, recognition, appreciation and standing in the hearts of the people who enjoy and appreciate her music and always come back for more! H.W.Longfellow said 'The heights by great men reached and kept were not attained by sudden flight, but they while their companions slept, were toiling upward in the night.' Sudha's life has been no different and with every mountain that she has scaled, she has always set her sights on higher peaks.